12 mix Roses with greens in a glass vase. 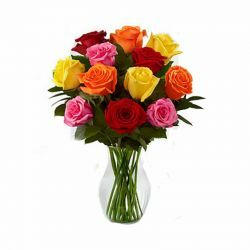 Send an arrangement of 12 Multi Coloured Roses in a glass vase to India on any special occasion. Brighten someone's day with this beautiful bouquet. Roses are so beautifully arranged in the vase and vase is also of good quality. Flowers are fresh and aromatic.